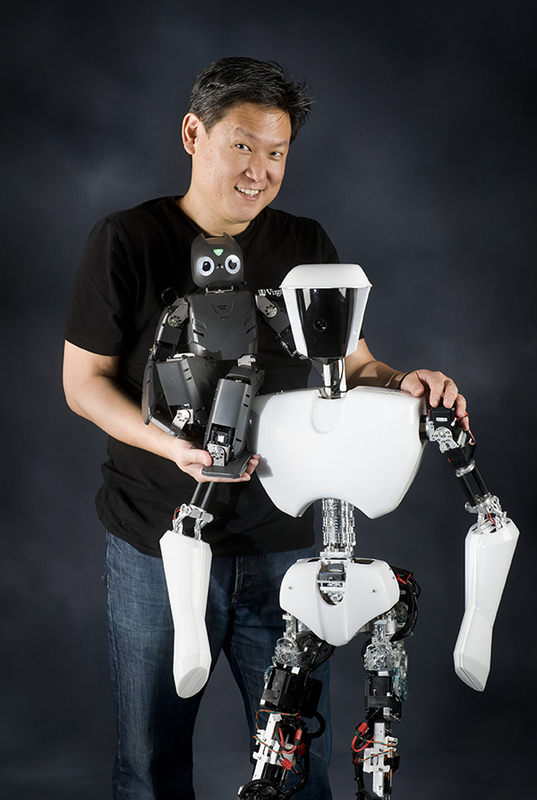 Dennis Hong is an American all-star in the field of humanoid robotics. An engineering professor at Virginia Tech with incredible mechanical know-how, he is also a creative genius who inspires others with his tangible vision. Alongside his 18 graduate students, Hong has built several of the most provocative and fascinating designs to emerge from the American robotics arena. His natural affinity for Disruptive Innovation and his constant challenge of routine thinking, make Hong’s public presentations not only inspirational but often life changing. Robots not only have the ability to change what we do, they can also change the way we think. Like many great minds throughout history, Hong often finds inspiration for his robotic concepts in unexpected places and everyday activities. A trip to the Museum of Natural History to look at bones or just everyday people watching, act as inspirational sources for Hong, who has been titled the Leonardo da Vinci of robotics. Just as da Vinci was inspired by the flight of birds to conceptualize the first flying machine, so too has Hong grounded his creative process in the natural world. Hong’s dedicated robotics lab, RoMeLa (Robotics & Mechanisms Laboratory), challenges the future with the Cognitive Humanoid Autonomous Robot with Learning Intelligence a.k.a. CHARLI; the United States first full-size autonomous humanoid robot. CHARLI was first developed in 2009 and with continued research, has been elevated to a level that is on track with Hong’s goal to humanize robots. CHARLI can walk, talk and even play soccer. One of the interesting comparisons that Hong makes about the future of robotics is the link between cultural attitudes and buy-in from society. Hong has attributed America’s hesitation of robotics to be linked to the often negative reputation given to robots, while Korea and Japan embrace the robot in a wider social context. Hong sees pop-culture as the catalyst for this negativity in America where robots are often portrayed in movies and television as evil characters, in contrast to the likes of Astroboy, a superhero robot boy watched and enjoyed by Japanese children for decades. Hong is committed to disrupting our thoughts about robots and we plan to give him the chance to do so at the 2015 CoreNet Global Summit in Los Angeles. Don’t miss your chance to see these incredible robots at work in the Innovation Pavilion at this year’s North American Summit. It promises to be nothing short of inspirational. Get ready to be disrupted.